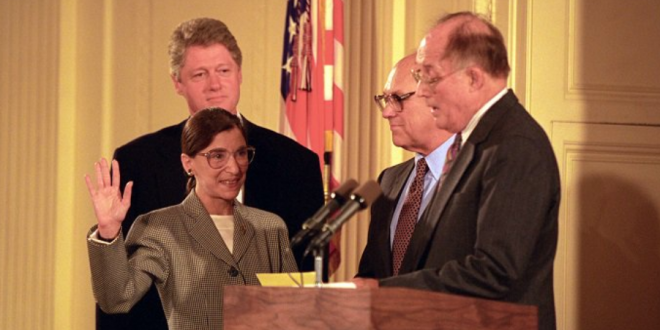 Notorious RBG Marks 25 Years On Supreme Court - Joe.My.God. There is something in the current “Notorious RBG” fervor that offers the perfect paradox for a woman whose early career was marked by rejection and work in the trenches of anti-discrimination law. Ruth Bader Ginsburg’s superstardom has not been fleeting, precisely because of what she did before and what she represents today. She made the law review at both Harvard and Columbia law schools and graduated at the top of her class at Columbia. Yet she was rejected for the most prestigious judicial clerkships and spurned by law firms. It was not just that she was a woman. She was also a mother caring for a young daughter. But that was nearly six decades ago, and on Friday, Ginsburg marks the 25th anniversary of her judicial oath on the US Supreme Court. Anyone else freak out when they saw “Ruth Bader Ginsburg” was trending?